Whether you are bringing children along or want to let your inner child loose, be sure to visit a climbing park this summer! Come and swing through the trees like Tarzan, take on lofty obstacle courses or test your balancing skills while dangling up above the ground. There are a growing number of options. Existing parks are expanding with new obstacles and activities, while new facilities are appearing on the scene with the newest one being in Trysil. 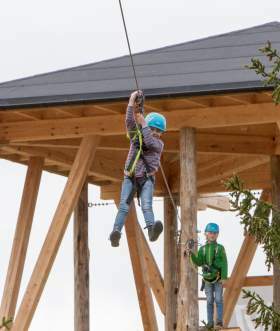 “Climbing parks are suitable for the entire family, and there is something both children and adult visitors can do together,” says Robin von Braun, chief of operations at the new park. The courses have varying grades just like the slopes at the nearby alpine skiing facility. You must be minimum 80 centimetres tall to try out the most basic course – and the taller you are, the higher up in the trees you get to climb. If you are over 140 centimetres tall, you can do it all. “Everyone will find a way to challenge themselves, whether you prefer to stay a metre of two above the ground or want to be high up in the treetops,” says the operations chief. One of von Braun’s personal favourites is the zip line, which is suspended above several of the jumps in the Bike Park. 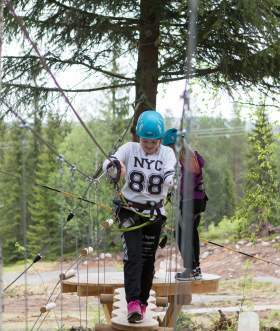 “The Climbing Park is in the same area as Trysil’s Bike Park. In fact, the parks are so close in some spots as to allow great views of the bikers who are enjoying the trails on the ground below you,” says von Braun. As Trysil is usually associated with snow and skiing, von Braun intends to keep the new climbing park open in the winter. “When everything is nice and white here, we might have as many as 20,000 visitors at the Alpine facility on a good day. There is a good chance that some of them would also enjoy having a go at our climbing facilities as well. Wearing more clothing and thicker gloves, I believe visitors will have a wonderful experience,” he says. The facility in Trysil is far from the first one in the Høyt & Lavt (i.e. High & Low) series. It is actually the ninth climbing park they are opening in addition to the high-flying zipline they operate near Preikestolen. One of the parks, Høyt & Lavt Vestfold, is Scandinavia’s largest climbing park, which is full of high-hanging challenges. Additionally, they have parks in Oslo, Bergen, Kristiansand, Sørum, Bø i Telemark, Hallingdal and Nedstrand. But, the list of Norwegian climbing parks is more extensive than this. Below are some more alternatives for all of you climbing enthusiasts.